Lab name: Nanoscience Research Group. 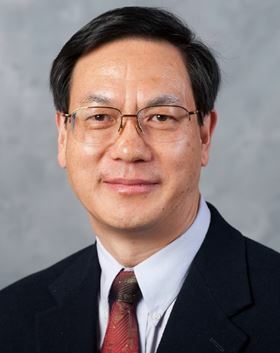 Lead professor: Zhong Lin Wang. Personal electronics are now ubiquitous – but with their surge in popularity comes an ever-increasing need for portable power sources. Currently, rechargeable batteries are the most common remote power source but will be unsuitable and impractical as electronics become smaller and are integrated into other devices such as health, infrastructure and environmental monitoring systems, the Internet of things, and defense technologies. Instead, different power sources will be needed for this new generation of micro/nano systems. The group has been running since 1995 – for 21 years until now. Currently, we have 30 members in our group, including postdocs, PhD students, visiting scholars, and research scientists. Our research mainly focuses on: nanogenerators and self-powered systems, mega-scale blue energy, piezotronics and piezo-phototronics, and piezo-phototronics for energy science and optoelectronics. To meet the technological challenges of integrated electronics, I proposed self-powering nanotechnology in 2006, aiming at harvesting energy from the environment and our bodies to power micro/nano-system-based sensor networks. After 11 years of effort, we have developed the science, engineering, and technology of nanogenerators, not only as a sustainable self-sufficient power source for micro/nano-systems but also as self-powered sensors for detecting motion, vibration or any mechanical disturbance without an external power source. This research aims at solving the power needs for small electronics. With 70% of the earth’s surface covered by water, wave energy is abundant and has the potential to be one of the most environmentally benign forms of electric energy. But the lack of an effective technology means that water wave energy harvesting is largely unexplored. We have developed a network design of triboelectric nanogenerators (TENGs) for large-scale harvesting of kinetic water energy. Relying on surface charging effects between conventional polymers and a very thin layer of metal electrodes, a TENG network floats on the water surface and converts the slow, random and high-force oscillatory wave energy into electricity. Given its compelling features, such as light weight, cost-effectiveness, environmental friendliness, and easy implementation, the TENG concept brings an innovative approach to large-scale blue energy harvesting from the ocean. Schematic illustration of the structure and working principle of the triboelectric generator. The structure of an integrated generator during bending and releasing process and related electrical measurement tests. Photo of a flexible TEG and mechanical bending equipment. Reproduced from: F. Fan, et al. Nano Energy 1 (2012) 328. Known for centuries, the phenomenon of piezoelectricity produces an electrical potential in a material in response to pressure changes. The most well-known piezoelectric material is the perovskite-structured Pb(Zr,Ti)O3 (or PZT), which has found application in electromechanical sensors, actuators, and energy generators. But PZT is an insulator and less useful for building electronic devices. Wurtzite-structure materials, such as ZnO, GaN, InN, and ZnS, also have piezoelectric properties but are not extensively used because of their small piezoelectric coefficients. However, the effect of the piezopotential on the transport behavior of charge carriers in these materials is significant. By utilizing these properties, new fields have been created. We coined the term ‘piezotronics’ in 2006 to describe electronic systems in which the inner-crystal piezopotential is used as a ‘gate’ voltage to tune/control the charge transport behavior. Piezotronics will have important applications in human-CMOS interfacing, micro/nano-electromechanical systems, nanorobotics, next generation sensors and transducers, smart electronics, flexible electronics and much more. The piezopotential can also raise the Schottky barrier height at a metal-semiconductor interface or change the transport at a p-n junction, while laser excitation can lower the Schottky barrier height. We are using the coupling between the piezoelectric effect and laser excitation to introduce new optoelectronic devices. The piezo-phototronics effect, a term we coined in 2009, is a result of three-way coupling between piezoelectricity, photonic excitation, and semiconductor transport, which allows tuning and control of electro-optical processes by strain-induced piezopotential. Recently, we have applied this effect to the fabrication of highly sensitive UV sensors, LEDs with enhanced efficiency, and high-performance solar cells. The development of piezo-phototronics will have great impact on ZnO and GaN optoelectronic devices and energy science. How and why did you come to work in this area? These fields have critical applications in energy science, the Internet of things, human-machine interfacing, and medical sciences. The concepts of nanogenerators and self-powered systems, piezotronics and piezo-phototronics were pioneered by me and I have been working on them for the last 11 years. In our lab, we have facilities for physical vapor deposition (PVD), nanofabrication, rapid thermal processing (RTP), spin coating, optical microscopy, scanning electron microscopy (SEM), transmission electron microscopy (TEM), atomic force microscopy (AFM), ultraviolet–visible spectroscopy (UV-Vis), various electrical measurements and optical measurements, as well as lasers, low-temperature probe station, tube furnaces, ovens, and spectrometers. The lab must have a central theme of research that is world leading; there must be a great culture of innovation, keenness on deep science, hard work, and collaboration. The group members need to be self-motivated and have goals and dreams of their own. We will continue to drive our research in the field of nanogenerators for self-powered systems and piezotronics for smart devices. Electroceramic Materials Group at Imperial College London investigate materials for low-cost, high-efficiency fuel cells and batteries.